So, there's been a lot of buzz in the circles that I travel in about this series from Image Comics, but I just didn't get around to reading it yet. When my local comic shop, Clem's, announced a deal that they were going to run to get new readers in on the series where if you bought the collected edition of issues 1-6, they'd give you a free copy of issue 7, I thought I'd bite and take a chance on the series. Well... I'm not as blown away by the story as I thought I'd be. 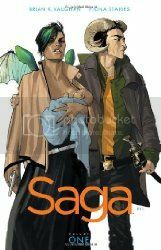 Part SciFi Space Opera, part Fantasy, part Romeo & Juliet love story, Saga tells the story of Marko and Alana, each from opposite warring races who have fallen in love and have even had a child (no spoilers here, the child is born on page 2 of the first issue). What is interesting is Alana's race finds their power in technology, while Marko's race finds their power in magic, so their daughter is a mixture of this science and magic. What follows is Marko and Alana on the run from their respective governments and armies, bounty hunters, and in some cases the indigenous life of the planet they are on, trying to keep their daughter alive. I'm assuming that the daughter lives, as there are parts of the story that she is narrating as she remembers events. Fiona Staples' artwork is excellent, and Brian K. Vaughan's writing is certainly up to his usual standards, there just wasn't a whole lot that happens in these first 6 issues, and I think what happened is that the story was just so hyped up for me prior to reading it, I think the series never had a chance to impress me all that much. I haven't read the free copy of issue 7 yet, and I'll more than likely pick up the second volume of the collected editions, as I'm curious enough to see where the cliffhanger in issue 6 takes them, but if there stands a strong chance that I may not read the series beyond that. It's not that it's a bad series, just not for me.